Prior to realizing that I had Chronic Exertional Compartment Syndrome I had put marathon training on the back burner so that I could focus on getting faster at the half marathon. To tell the truth, part of what factored into that decision was the fact that my calves felt so crappy and that my feet would go numb when I ran sometimes so the idea of training for a marathon became unappealing. But mostly I was still ignoring the fact that I had a medical issue and really just wanted to improve upon my half marathon time which seemed much more doable than the marathon in general. At my paces, and with my running experience of only a few years, it made sense to me that I should work on shorter distances before I tackled the marathon again. Don’t get me wrong, I definitely caught the marathon bug when I decided to become a runner, but crossing the finish line in Portland in 2014 fulfilled the urgent need I had to become a marathoner. 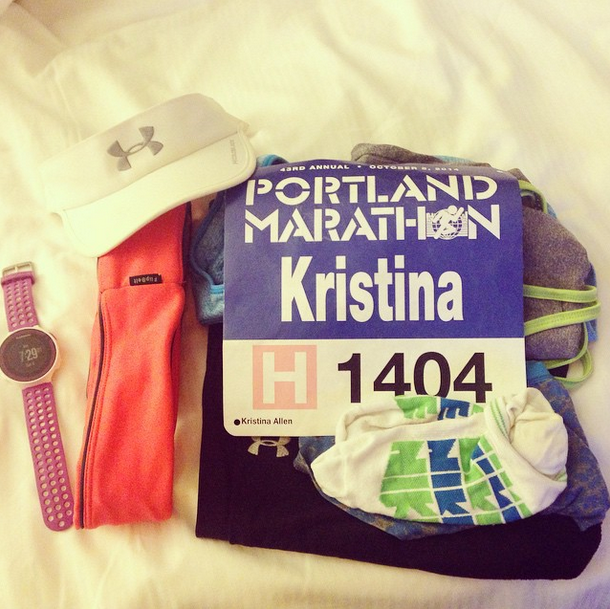 I still really want to run another marathon…. many more marathons and even more ultramarathons. But even now, on this side of surgery, I still think the half marathon should be my focus. Actually, on this side of surgery I am dying for a half marathon PR! I am having so much fun seeing that my body is capable of hitting paces that it wasn’t able to even come close to hitting when my symptoms from compartment syndrome became too evident to ignore. I wake up excited on Wednesdays to know it’s a quality run day and my legs are going to get to turn over fast. I am absolutely loving the feeling of pushing myself to see how fast I can go at different effort levels. At the same time I don’t love 5K training and aside from when I first started running I have never really actively trained for a 5K. My current 5K PR came right after marathon training and I’m happy to continue to double dip in that way. As much as I love feeling my feet turn over fast, training for short races doesn’t appeal to me because it sounds so painful! Training for a half marathon PR will be hard work for sure, but at least I will be training at paces that I have to sustain over 13.1 miles instead of 3.1 miles. That probably sounds crazy to non-distance runners but I know you know what I mean. Okay, all of this said, I really want to run the London Marathon! I will probably keep putting my name in the lottery every year since it’s so hard to get into, and if I somehow I get in I’ll consider that a sign that I’m meant to run another marathon sooner rather than later. If I don’t get in through the lottery system in the next couple of years, when I’m ready to tackle the marathon again (hey, 2020 I’m kinda looking at you) I’ll probably run London for charity. This year is all about getting back into half marathon shape and seeing how far I can take it. I’m so excited about summer training and fall racing, I hope you are too! Previous Post I Cut Off 6 Inches of My Hair! The older I get, the more unappealing a road marathon sounds to me! Marathons really beat the body up. I am amazed at the people who can run several a year. I don’t think I could handle marathon training right now. I think I would get injured. But I also think I would get injured if I tried to PR at shorter distances! I guess I just don’t feel like a very strong runner right now. Even though I really, really, really want to spend my 52nd birthday celebrating on the Boston race course in 2020, I’m not sure I will be able to qualify again. Getting a BQ is my only interest in running a full marathon right now. I used to love training for marathons, but with my latest injuries it makes the idea of running far really dreadful! I will have to think really hard about running Boston for charity. That’s a ton of money for me to raise (IF I got accepted) and I’m not sure I would enjoy that process. It might just be too stressful. Time will tell! I am thinking of a 2020 marathon too…something flat and cold. Maybe Chicago!